I have become a Mint connoisseur, which I enjoy growing. 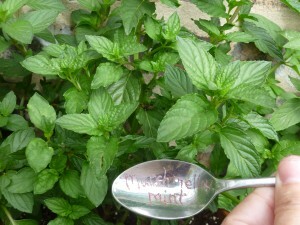 Here is a comprehensive mint variety list, comparison and review of a great number of mint varieties. 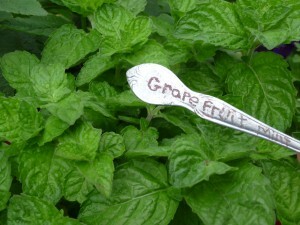 Each mint will have a description of the mint plant as well as scores on several properties of the mint. Comments: This is a common mint with nothing special about it. Comments: The leaves are a very bright green and each one is textured so it is a nice addition to a garden. 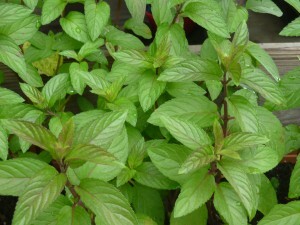 It is a very bright flavored mint and nice to have around for basic cooking needs. It spreads quite well. The one I have is a cutting from a neighbor. I was able to make 5 to 4 cuttings from a very small plant. It has filled a 4” by 24” pot by the end of May with very small plants this spring. Cutting it makes it seem to grow more. Comments: The leaf shape and texture is OK, but it has an almost purple hue to the leaves so it is a good color addition to a foliage garden. It filled a 4” by 24” pot with the pieces we pulled from my father’s garden this spring AFTER he already pulled the majority of the runaway runners out earlier. The pot it was buried in cracked and the mint made a run for it. Mojito Mint- Purchased from a local nursery, Gethsemane in Chicago, IL. Comments: According to the tag only true Mojitos can be made with mojito mint. It has very large very bright green textured leaves. It is a very attractive mint. Cuttings root in water very well but so far I have no visible runners. 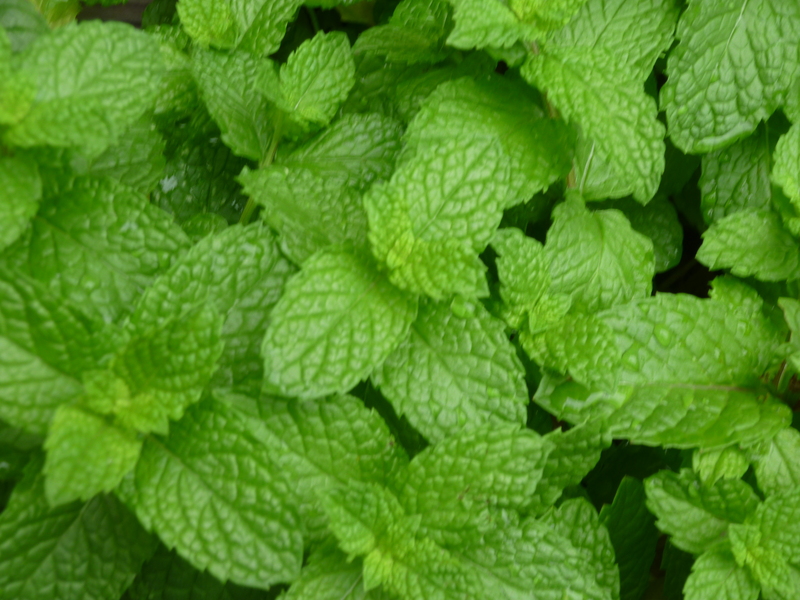 It is a very mild, sweet mint with a bunch of citrus over tones and can be almost bitter in taste. Comments: This tastes like Andes after dinner mints, and has what I refer to as the “wow” factor that a lot of the mints lack. Orange mint- doesn’t taste like orange to me at all. 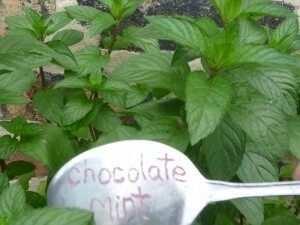 But chocolate mint you can’t mistake or miss what it is supposed to be but it is still defiantly a mint. Comments: The leaves are more rounded than most other mints and if in an area that gets almost too much afternoon sun it will blush a nice burgundy hue. 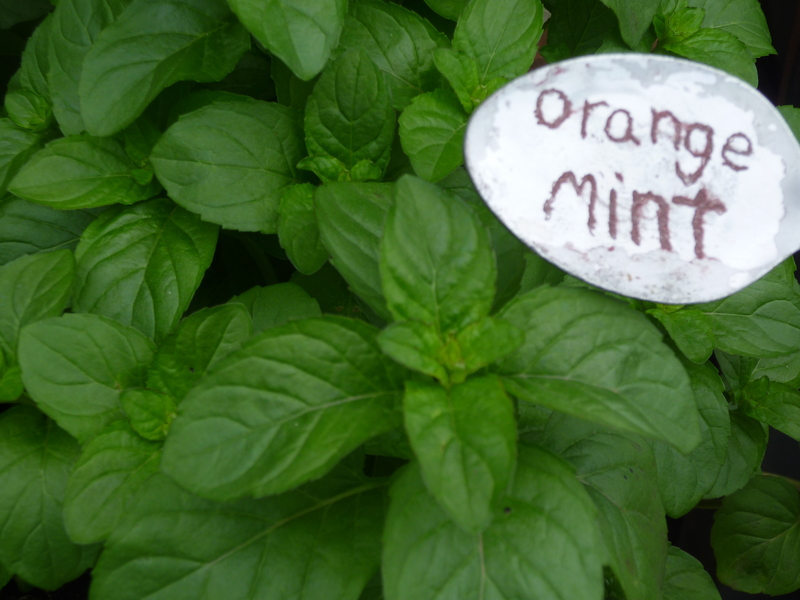 I can’t tell any citrusy hints in this mint at all, and when I asked a group of five during a mint tasting they couldn’t tell it was suppose to be Orange either. Pineapple Mint- Purchased from a local nursery, Gethsemane in Chicago, IL. Comments: I don’t particularly like the pineapple and mint combination. I don’t particularly like pineapple. However, the white edging to the mint leaves more than makes up for this failing. 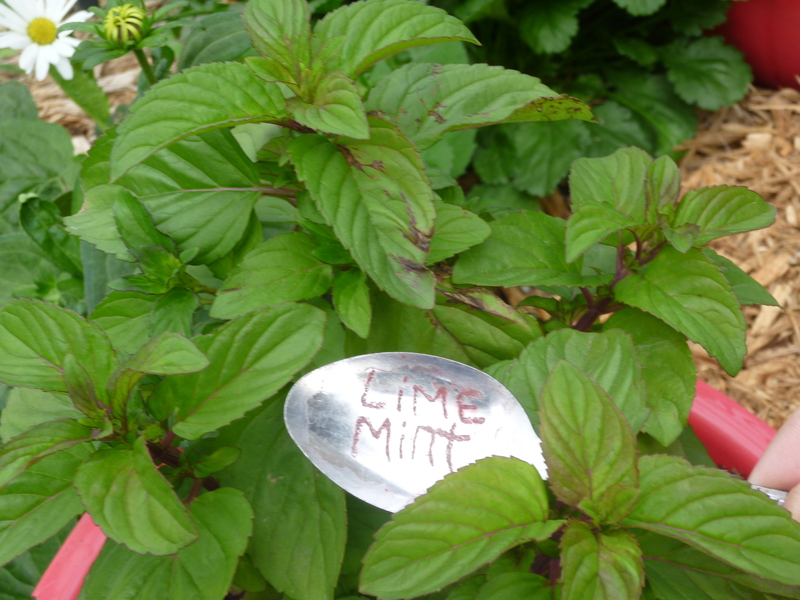 It is a beautiful addition to your mint garden that you could grow for appearance alone. So far it has not sent out any runners that I can see, so it is not as aggressively spreading as some. Berries and cream Mint- Purchased from a local nursery, Gethsemane in Chicago, IL. 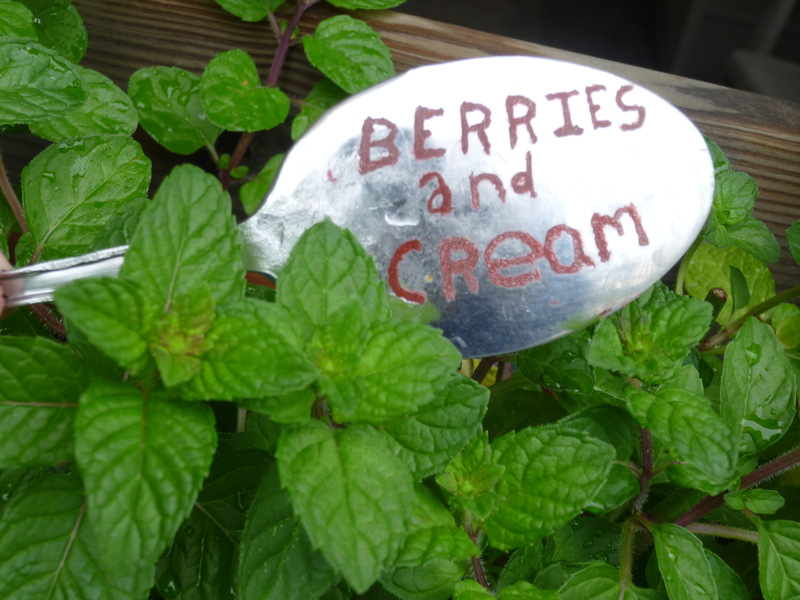 Comments: The leaves are nothing special, the mint flavor is very, very mild (I think the name berries and cream comes from the idea that it is a mild mint to enhance deserts with berries with a little mint, that isn’t over powering). This is the most aggressive mint I have ever seen. I have a hard time keeping it in its half of the container. Not only does it have runners but those runners root faster and sprout full sized plants faster than I have ever seen. You want a ground cover mint- go with this one. I mean it, I feel like I have to go at it with an ax to keep it where it should be. And NEVER, EVER plant this in the ground, even in a pot in the ground if you don’t want it everywhere. The runners run along the top of the soil so a pot won’t stop this bad boy. Lemon Mint- Purchased from a local nursery, Gethsemane in Chicago, IL. Comments: This is not to be confused with Lemon Balm- I did for a little while, since they are both in the same plant family. The leaves are unremarkable and the flavor while lemony doesn’t seem to shock people. 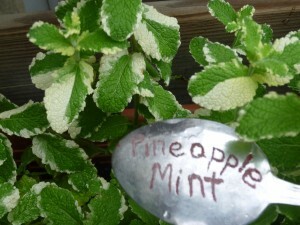 Mint and lemon make a wonderful flavor combination so I can see a lot of culinary opportunities for this. There are a few runners already this year, but it just seems like the normal mint level of assertiveness. It makes a nice tea. Comments: This mint was not breed for its flavor or aroma. It was breed because the flowers do not bloom in a spike but in a ball. I have finally seen it bloom. Yes, it blooms in balls, but the mint flowers are not striking enough to make ball shaped blooms desirable enough to purchase from a far. It has not sent out any visible runners. Young leaves are very fuzzy, but they lose some of that as they grow. Comments: This mint is very nondescript. The name comes from the idea that it is a mild mint to enhance deserts with fruit with a little mint, that isn’t over powering. This might be true, but in all other regards this mint doesn’t have anything exciting enough about it to recommend it. I want a mint that people smell or taste and say – wow!- or “my goodness”. 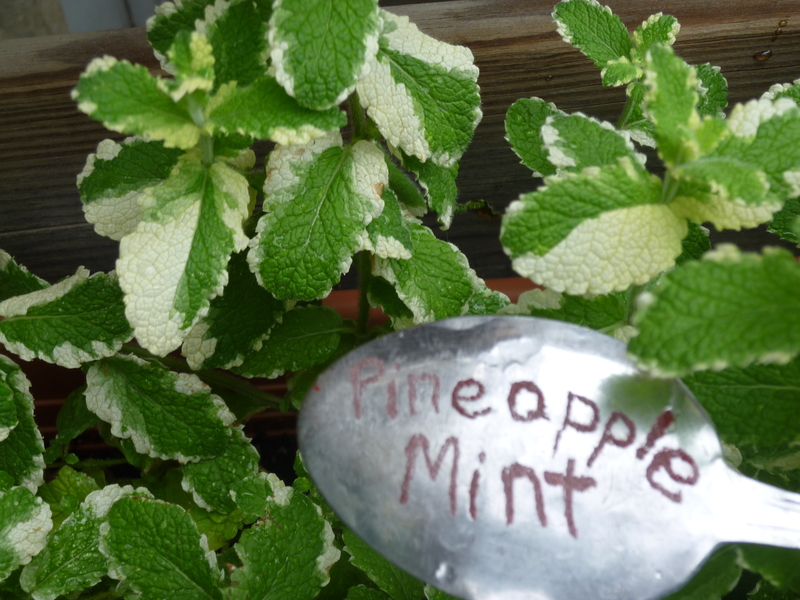 I want a pretty mint that adds texture, height, or color to the garden. 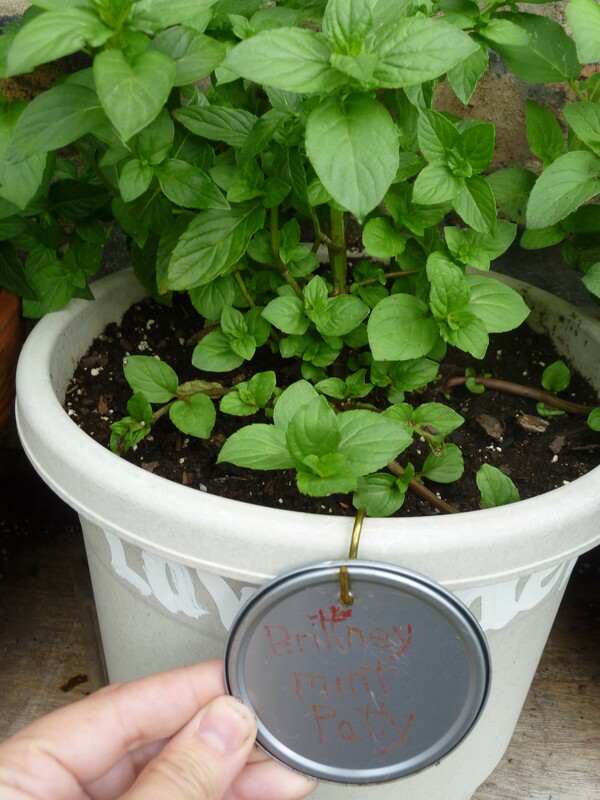 I want a mint that I can propagate or fill a container with. Finally, it has some of the red and purple highlights that made it so attractive to purchase, but I had to wait until mid August. Because of that I have bumped the appearance up to a 2. Comments: This is a “wow!” mint. I think it smells and tastes like an iced minty coffee drink. It is just amazing and it is my second favorite mint. The leaves are a deep rich green with a little curl to them so they are very nice in appearance. They are still minty but they have a coffee, hazel nutty tones that are front and center instead of an under tone. I just can’t say enough about this mint. I love it! Unfortunately it has sent out only one runner, and that one has not sprouted yet, so it does not spread quickly. Comments: This does have a lot of pear scent. It has little mint tones, so this might be a great desert and fruit mint as well. It has not sent out any runners and does not spread quickly. The leaves are not very remarkable in appearance. Comments: When I purchased this the picture had yellow centers to all the leaves. I have yet to see that. I was told the plant needed to “mature” so maybe I will see it in the fall when the leaves change, but some never have yellow. It is very gingery, so that is a plus. 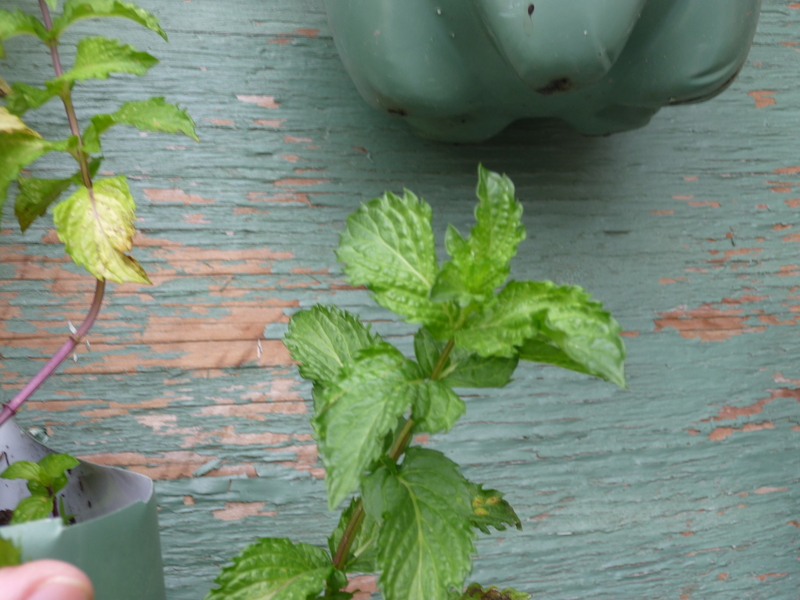 It is so gingery and not very minty that this plant has pest problems the neighbors that are more minty do not. Lime Mint- Purchased from a local nursery, Gethsemane in Chicago, IL. Comments: The leaves are very large and glossy with lots of red hues to them. I can’t taste the lime in these until a little while later on my lips if I lick them. However, I find the plant so appealing that I don’t care about the rest. It has sent out some runners so it does have the growth that usual mints have. They do not have a pest problem. Curly Mint- Found growing wild in an alley. Comments: I found this in an alley behind a middle eastern restaurant. I don’t know if it was a volunteer from the middle eastern cooking or planted intentionally, but it had spread enough that no one was going to notice if I dug up a little and took it home. I am only assuming it is curly mint based on the appearance and a nice Google search. It is very minty without becoming bitter tasting as so many of the “citrus” ones tend to do. Comments: This plant has a lot to recommend it. The leaves are rounded with a curly jagged quality that I really find attractive. It is still a very minty mint, but the grapefruit is really apparent. It is a tall plant so it isn’t dwarfed easily and it has several runners that make it easy to fill its space and propagate. I think that this is a good quality mint to keep around for a variety of culinary and aesthetic purposes. Julep Mint- Purchased from a local nursery, Gethsemane in Chicago, IL. Comments: This is a very tall mint plant and the leaves smell just like spearmint gum- very sweet without any bitterness at all. It spreads rapidly and the runners root well. 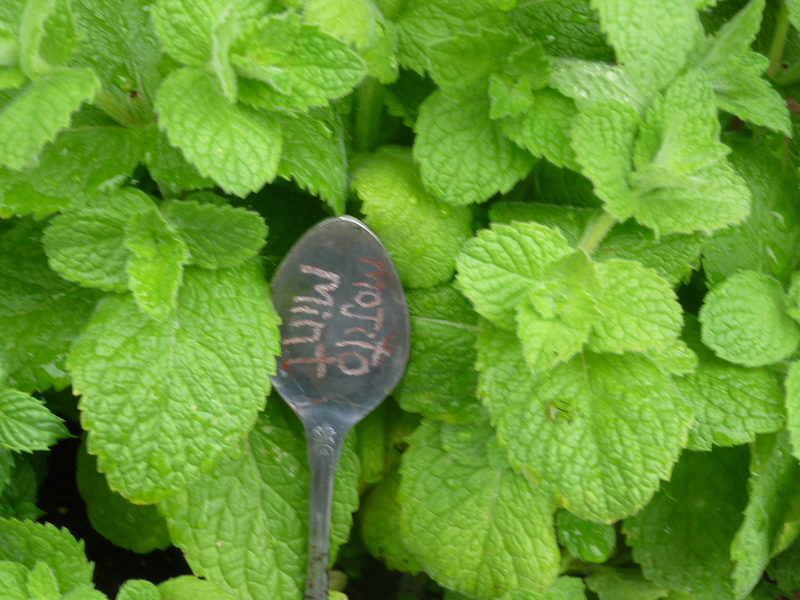 Overall, if you have to choose one mint for your garden for your culinary needs, I would choose this one. Comments: This mint doesn’t have anything striking about it to recommend it. I do not think it smells like marshmallows. This mint did not survive the winter, all the other mints did. Comments: This mint doesn’t have anything obviously striking to recommend it. Comments: The color was unusually bright green and the leaves are fuzzy when it arrived. It has since lost all of its uniqueness. Now I want to get more mints…..
Sure- you can use my rating system! I have a little request though, since I’m not a native English speaker, can you also put their latin names so that I can identify them better? Also I have a question. I have read in Google, that peppermint has more mintiness than spearmint, but you say here otherwise. Are you sure about this? Of course I would believe you more since you seems to have more experience with different kind of mints. Unfortunately I don’t have the Latin names, and I don’t know if some of the hybrids even have one. Sorry! 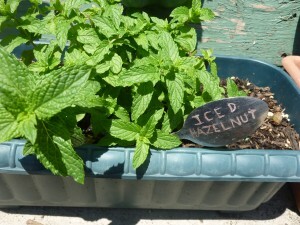 I am also not a mint “expert” but a passionate hobbyist. I am honestly surprised by how many comments I get! I just made the blog post for me, because I wanted to keep track and as my family has said about me in the past “She has so much she wants to say!” which couldn’t be more true. So I am humbled by the interest and comments. Thank you. 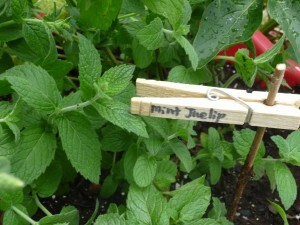 I am not sure if any mint repels mosquitoes- I wish there was! I bought a small plant that was tagged as sandalwood (not sure why I bought it since I’m not a fan of cologne type smells), when I got it home, and did my belated research, I found out that sandalwood was a tree and this was obviously a plant. 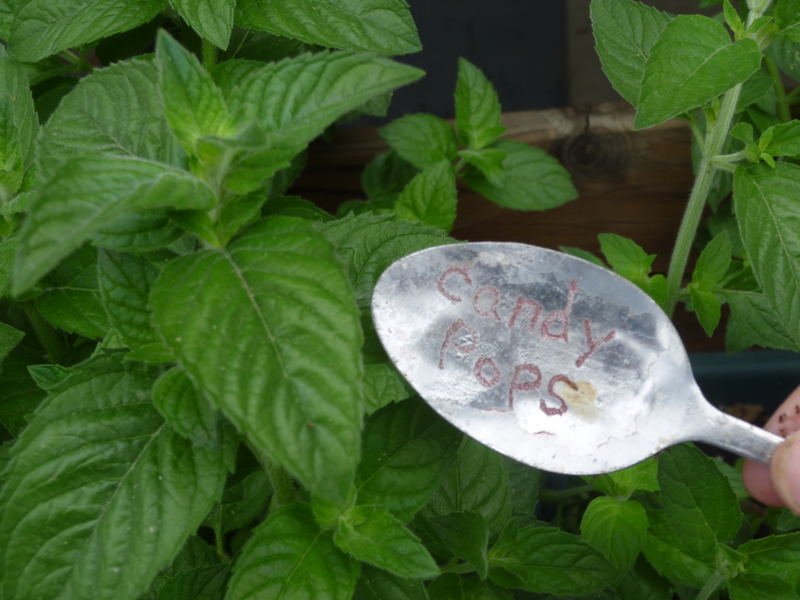 I called the farmer who told me it is a type of mint, and that’s all the info I have. It has no mint scent a strong cologne scent it is assertive and has striking red stemmed runners. Do you have any idea what it might be? My research is coming up empty at every turn. 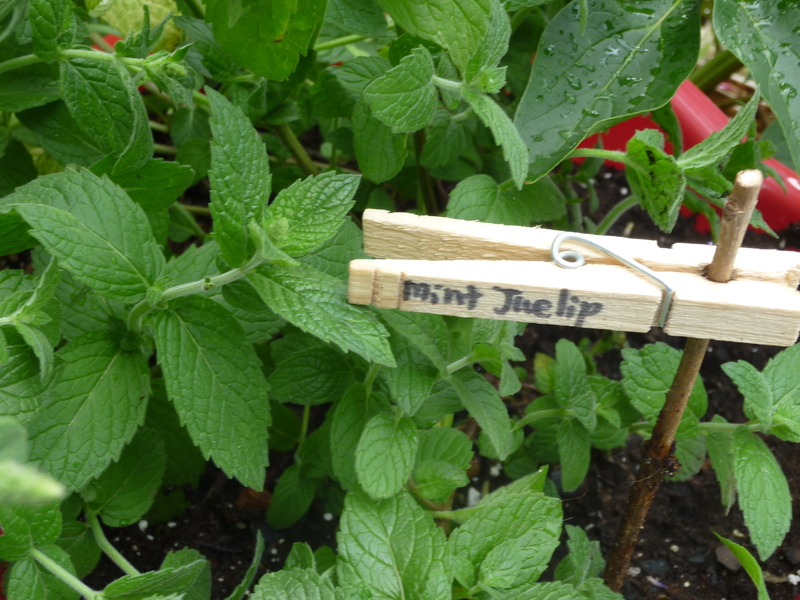 Jeana a fellow mint lover/horder. Sorry, I am not aware of the variety. It could be eau definitely cologne mint? Apparently can kill wasps and flies. 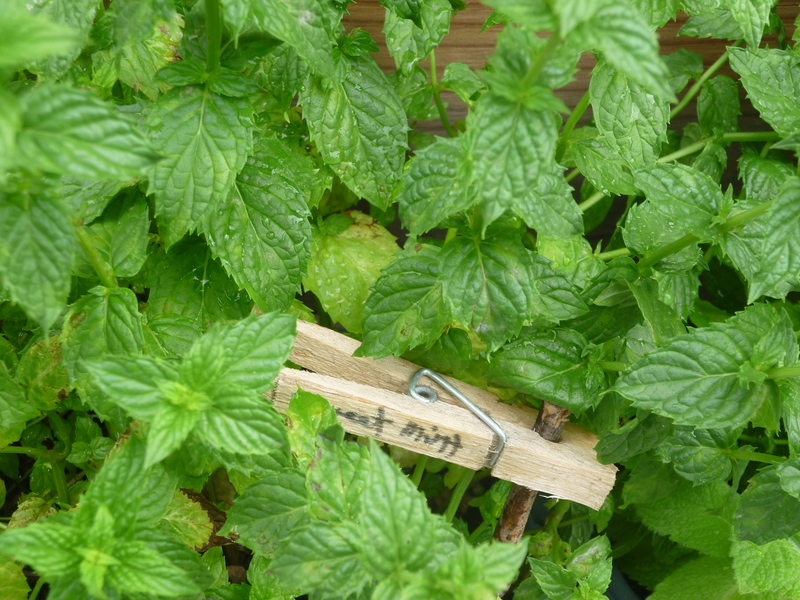 There is a well established mint variety called ‘Eau de Cologne, which is very fragrant as a dried flower, and is used for that! Hi there! Love your blog. 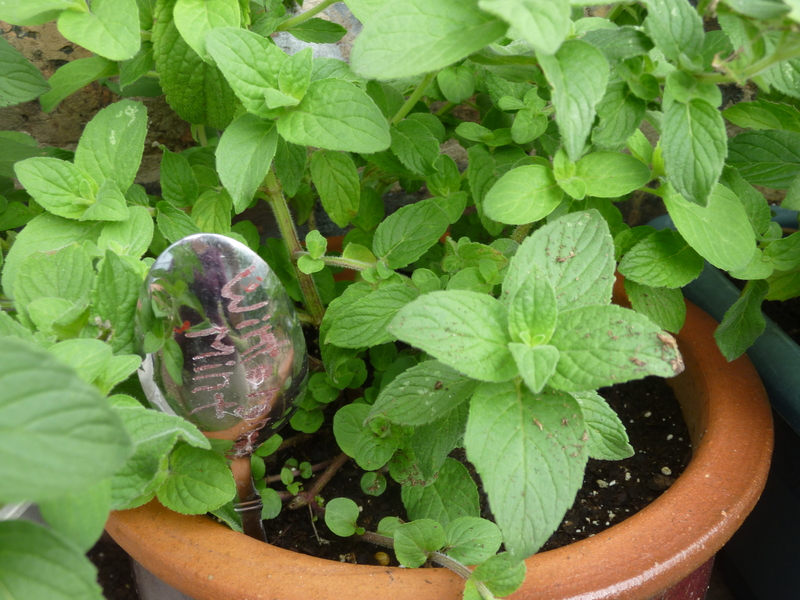 I am in love with my mint too . Have you heard of Snow Peppermint ? My daughter travels around the world & reports back to me about the many varieties of my favorite plant. New Zealand seems to have this snow peppermint. Thank you so much for this information…I am looking for a “wow” mint. Thanks to you, my search is over! I love lemon slices, cucumber slices & mint in my water. I actually drink more water that way….just wanted a more potent mint than what I’m currently growing. It is best if the plant is marked when you buy it. If it is not, then it is hard to guess if it isn’t a distinctive variety. 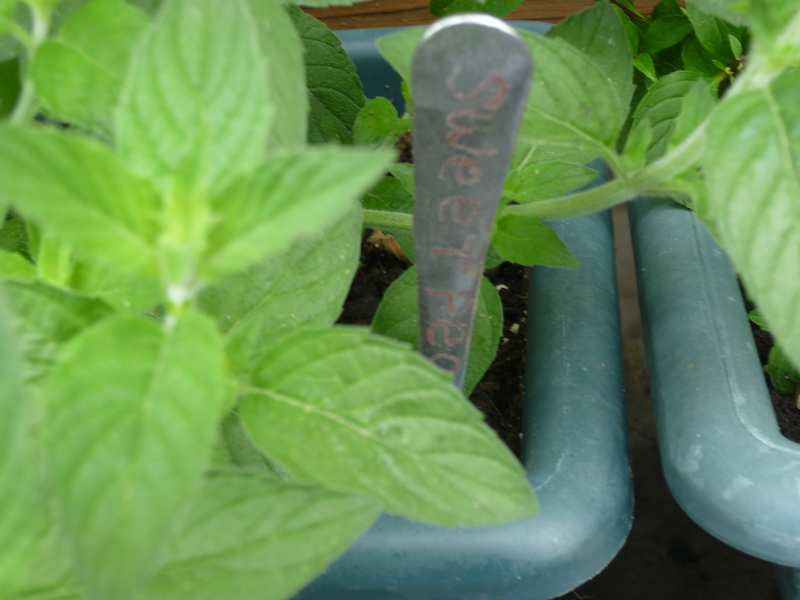 I was wondering if I wanted to plant a couple different varieties of mint how far apart would they have to be so the bees won’t cross the varieties? I L❤️VE YOUR BLOG!!! Thank you so much for sharing and giving us your time, a very precious gift. That I don’t know. I would recommend calling an extension service in your area. Thank you so much for your reply I will definitely do that. Happy Holidays!! I have a plant that was purchased from the supermarket. 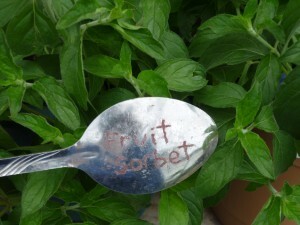 It was just labeled as Mint…. it’s been growing in doors in a medium pot. It’s been growing like normal everyday mint until recently it started to grow sprouts with dark green leaves on red colored stems… I’m having a hard time figuring out if it’s a specific kind of mint. Any thoughts? There are hundreds of variety of mint… so I am not sure. 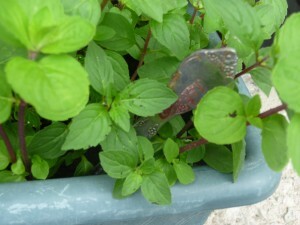 Some of my mints do have red colored stems. I was searching the internet to find a place in the USA to buy red raripila mint and your blog popped up. Do you know of any place in the USA to purchase it? Thanks.